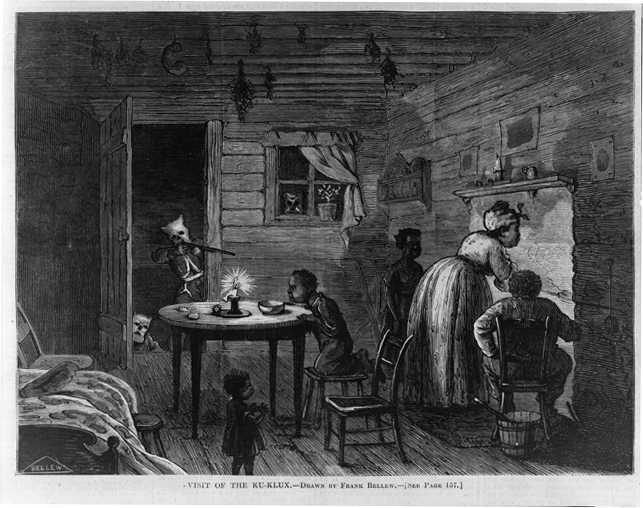 Visit of the Ku-Klux, Harper’s Weekly, February 24, 1872. Slavery Is Dead? Harper’s Weekly, January 12, 1867. ORLANDO: The picture on the left shows someone being sold. JULIAN: There is a guy with a whip on the right hand side. TAVI: The person being whipped is covering his mouth — that’s a metaphor for he can’t speak. Above, the statue of justice is blindfolded, blind to the unfairness. ORLANDO: The picture says “Public Sale” — anybody can buy him. KAYLANNA: The person whipping the slaves is smiling, also the people watching. ALEX: Liberty in the whipping picture is holding a scale that’s off balance. RAVENNA: The whole thing was in the paper in 1867 — in Harper’s Weekly. MADDIE: Above the first picture, in the corner, it says “Auction Sales,” and there is the thing judges hit [a gavel]. JACK: It says “Liberty” on her hat. NYLA: At the bottom there is “State Rights,” a skeleton, a snake, hands holding the auction thing, and a whip. JONIQUA: All the people look like statues. LEILA: Before “Slavery Is Dead,” and afterward, there are question marks. It’s signed by Thomas Nast. LOGAN: He liked to show, kind of, irony. The black man is being sold in front of a liberty statue and he’s looking up at it. It looks like there are more black people about to be sold. DANIEL: The slave that’s being whipped looks pretty buff. They don’t have any guns. Why didn’t he get up, do some push-ups, and whip the viewers? LOGAN: You can tell that it’s the south because there’s a palm tree. It’s 1866 — that’s before Reconstruction ended. BEN: The eagle’s head is looking away from the slave. ANNELIESE: There are two dates — 1863 [and 1866]. RACHEL: There’s the Emancipation Proclamation, and they’re auctioning off slaves. TIM: I wonder who the guy whipping is. He’s whipping the freedman. TEACHER: Why are you calling him a freedman? TIM: Because he’s free. It’s 1866.
? : Either he did something, or he’s whipping him because he’s black. ROSE: They’re both punishments for a crime, but you don’t know what the crime is. I would guess it’s a fake crime so they could get their slaves back. 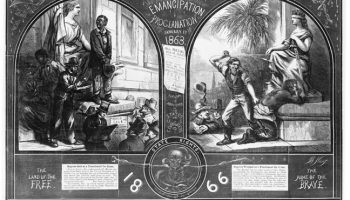 OLIVIA: “Slavery Is Dead” — they’re questioning whether it’s really true. BETHANY: 1867 is when it was published. 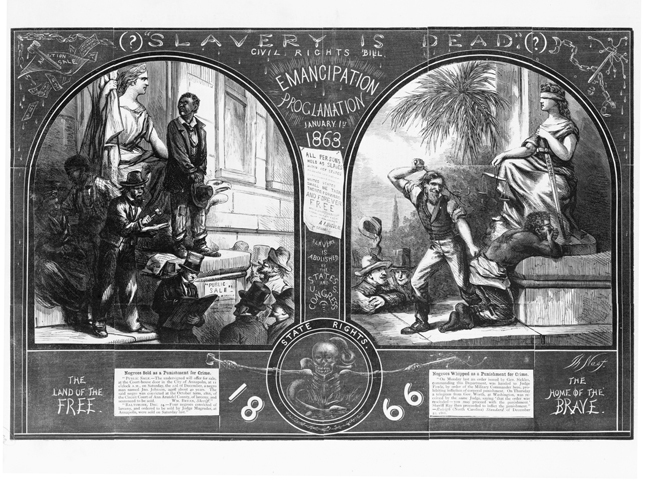 When it was published, I think slavery was dead, but I think the artist was questioning it. DANIEL: If it’s two free guys — he just got on his knees and let him whip him? Isn’t that his fault? ORLANDO: He didn’t defend himself, or fight back. RAVENNA: If he hasn’t eaten in a long time or is worn down…. FRANCESCA: If he fought back, the other white men would attack him in a mob. MADDIE: The white man could take him to court. TIM: It’s just, like, really palpable, the hatred that people would have against other people to do this. ELENA: People might think some people are inferior to them … but why do they think it will make it better to kill people? TIM: If you get enough white people to say black people are bad that’s going to happen. CLARA: You know how, in hotels, they have little notepads and pencils? The [back] has writing on it and a stamp on it — it might be from somewhere. JEFFREY: Two little babies taking a picture. NORA: Another random thing I noticed — in the background there’s a checkerboard pattern. ROSE: I think they’re, like, backdrops. BETHANY: I have a question. Why would they take pictures of themselves in their KKK outfits? They have masks over their heads — they don’t want people to see their faces. CLARA: [To say] I’m powerful, I’m better than you. ALEX: The family didn’t know there was a guy with a gun in their house? LUYA: There’s a really small room or bed on the left side.
? : There are three Ku Klux Klan members. LOGAN: I’m wondering why in the first place they had the door open. They wouldn’t have had it closed, because [if it had been closed], they would have heard them open it. LEILA: It might be hot out, so they might have left the door open. LOGAN: I’m surprised that there wasn’t more light. 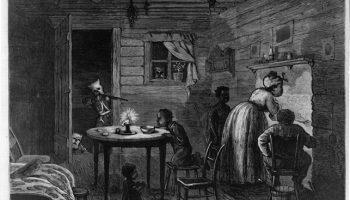 One candle, the fireplace — in reality it was probably quite dark. ANNELIESE: [The family looks] so innocent. NORA: They live in a one-room house — they probably didn’t have enough money to buy a larger house. NEIL: There are three klansmen. TIM: Did they just kill random black people? KARLTON: They chose people who were causing problems, starting things, trying to be big and stuff. … I think it’s because they fear them. CLARA: They would want to kill the ones who were the most threat to them — the radicals, the activists. ELENA: People who had something they wanted, like the Logans had a lot of land. Mr. Logan was big and strong, but a lot of them could overpower him. Image: “One Vote Less,” Harper’s Weekly (August 8, 1868), Richmond Whig (1872). To view the image, click here. Book: Susan Campbell Bartoletti. They Called Themselves the K. K. K.: The Birth of an American Terrorist Group. Boston: Houghton Mifflin Harcourt, 2010.